Discovering an unplanned pregnancy can be a very emotional, and often confusing, experience. It is a moment that marks an incredible turn in your life. If you have just learned you are pregnant, know that you have several options—you can continue your pregnancy and parent your child, continue your pregnancy and place your baby for adoption, or terminate the pregnancy. In this blog, we discuss your various unplanned pregnancy options, in hopes that your decision will be both informed and well-thought-out. This is an unexpected journey, but you can make it a positive one. Our goal is to guide you through it. As we walk you through each consideration, know that our team of adoption professionals and counselors is only one phone call away. You do not have to do this alone. We understand this is not an easy decision to make, but by giving you the right information and support, we can help you design a loving, thoughtful plan for your child. For most women facing an unplanned pregnancy, parenting is the first consideration to cross their mind. This may be the case for you. At this time, you may truly feel that you are the best-fit parent for your child. It is important to know, however, that parenting will require you to make big changes to your life plans and lifestyle. Parenthood is both challenging and rewarding. As a parent, you will experience incredible amounts of love and pride. Parenting also calls for a lot of hard work, patience, and flexibility. As you consider your options, try not to underestimate the amount of time, energy, and finances that parenthood involves. It is a 24-hour/7-days-a-week commitment for the next 21 years of your life. Are you ready? Are you prepared to handle everything that parenthood brings? Your situation may not be perfect right now, but parenthood may be possible. 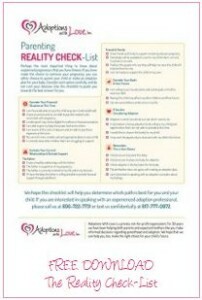 Find out if you are ready to become a parent by completing our free Reality Check-List. Like parenthood, choosing to make an adoption plan for your child also requires a lot of your love. Adoption is a strong, courageous, and selfless act that will give your child a life beyond what you can provide at this time. As you carefully consider your options, picture your child five or ten years from now. If you see your child in a place that you cannot get him or her, then adoption may be your answer. By choosing adoption, you will be able to give your baby the most significant gifts of all: opportunity, unconditional love, and stability. You can choose a family for your baby. You can also receive letters, pictures, or even have in-person visits as your child grows. Adoption does not put an end to your relationship with your child. Rather, it begins a new type of relationship for each of you. You can remain a part of your child’s life while still pursuing your own goals. Many birth mothers gain peace of mind after adoption, even while experiencing loss, knowing their child is loved and safe. Most birth mothers report that they know they made the right choice, even though it was a difficult one. At Adoptions With Love, we offer various adoption counselling services to help expectant mothers through the adoption process and with challenges they face before and after the baby is born. If you choose to place your child with a loving adoptive family, know that you still have various adoption options. Call us if you would like to discuss the many different closed and open adoption plans. There is no rush as you consider your options. Take time to re-examine yourself, your life, and your future. The best t choice will be the one that feels right in your heart; that gives you peace of mind and makes the most sense for you at this time. If you choose to continue your pregnancy, however, it is important that you begin prenatal care as soon as possible. If you choose to make an adoption plan for your baby, we can help you with the prenatal costs associated with your pregnancy. In the end, only you can decide what option is best for you and your baby. But you do not have to make this decision alone. Call Adoptions With Love toll-free at 800-722-7731 to learn more about your unplanned pregnancy options, or download our free checklist here to learn what option is right for you.